NEW ORLEANS -- This morning at approximately 8:45 a.m. CDT, a discharge of liquids was observed from a diverter valve on the drill ship Discoverer Enterprise,which is on station at the MC252 well-site. 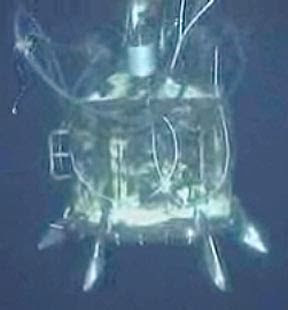 As a precautionary measure,the lower marine riser package (LMRP) containment cap system, attached to the Discover Enterprise, has been moved off the Deepwater Horizon's failed blow-out preventer to ensure the safety of operations and allow the unexpected release of liquids to be analyzed. Capture of oil and gas through the LMRP cap is therefore temporarily suspended until such time that the cap can be re-installed. Capture of oil and gas through the BOP's choke line to the Q4000 vessel on the surface continues. UPDATE: The cap was replaced at around 6:30 pm and appears now to be working as before the event. The standings in the Solar Car race have been added to the end of the post. Unfortunately the severe weather in the area today is not helping the effort either. Due to severe weather conditions expected across southeast Louisiana today, June 23, regularly scheduled cleanup and response efforts may be impacted/halted as weather systems move through the area. These efforts include controlled burns, dispersant flights, and booming operations. Source efforts and some skimming vessels may be operating as long as conditions do not exceed their operating limits. Protective boom is in place along many miles of Louisiana’s coastline. Crews will resume cleanups as soon as safely possible. Safety of all personnel is important to the success of this operation. At a press briefing in Washington on the event Admiral Allen blamed the event on an ROV hitting one of the valves on the vent at the top of the cap and causing it to close. With the vent closed the pressure under the cap would increase (since the flow would have a smaller area to escape through). That increase in pressure was enough to reverse the flow through one of the lines that send warm water down to the cap to keep it warm enough that hydrates don’t form. It appears, from Joel Achenbach's Washington Post report that oil and gas was found coming out of a line that was pumping the water down, which raises a little question over the flow circuit being used that would allow that to happen? That discovery led to the cap being removed from the well for inspection. Any gas outlet at the surface would pose increased risk to those running the operation and had to be dealt with immediately. The current plan is to replace the cap later this afternoon, presuming that the blockage has been removed. Unfortunately, without the pressure gage recordings from inside the cap it is not possible to know if the pressure build-up was gradual, which could be explained by this deposition of material in the flow path, or if it was a step-function which would more likely result if an ROV had nudged a valve closed. 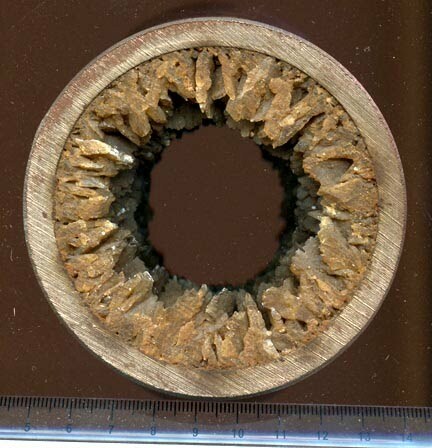 As I mentioned earlier the alternate hypothesis is that there has been some crystal growth within the flow path through the cap, which caused crystals to grow, constricting the channel and thus raising the pressure in the cap itself. The pressure jump cannot have been too rapid if the indication of the problem came from the backup of oil and gas out of a water line. And crystals can form either quickly, in large size, or more slowly and insidiously. Out of abundance of caution the Discover Enterprise removed the containment cap with the riser pipe and moved away until they could assess the condition. They have indicated that the problem was a Remotely Operated Vehicle that had been around the (inaudible) package that bumped into one of those vents that allows the excess oil to come out. They actually closed it thereby creating pressure and the backflow potentially off the water vent. They are checking the containment cap right now that there are no hydrates in the containment cap. They will attempt to reinstall the containment cap and begin producing later on today. If there are hydrates they will probably have to rerun the pipeline, and that will take a considerable amount longer. My understanding was they noticed there was some kind of a burp in the line where there was either natural gas or some reason. They thought they had product—or hydrocarbons coming up through the water line that's usually meant to carry hot water down, which is to heat the pipe, as you know to do away with the hydrate problem. When they thought that that line might have been compromised, or they have the chance that they might have hydrocarbons coming up through that vent into the Discover Enterprise, which is flaring right now, over an abundance of caution they elected to remove the cap and move the riser pipe and the cap away. When they moved it away then it's open to seawater. And they said if there is any product there you have the chance for hydrates to form. So before they decide to move it back in they have to check and see if there are any hydrates there. If there are hydrates they are probably going to have to pull the drill pipe and reinsert it once the hydrates are cleared. And again, the initial indications were that one of the vents, which is allowing the oil to vent so the cap will stay on will somehow might have been dislodged by coming in contact with our ROV. But I think they are trying to validate that right now. They do know that one of the vents was shut when they set the second ROV down to take a look. That's all we have right now. We're continuing to look into it. they found this out after the fact when they set their ROV down after they had removed the containment cap that it appeared that one of the vents had been closed. Now the assumption is that was a result of an ROV bumping into it and actually closing the vent. We don't know that for sure. I think we're still developing the facts associated with it. I don't think it's any problem in putting on an exact timeline when we get all that stuff together. The Admiral also updated the schedule for drawing oil from the BOP through the kill line. The riser to carry that has been installed, and they are now hoping to have that hooked up to a second vessel by next Tuesday. This will increase the production capacity from the well to 53,000 bd. We have been taking samples again, of worker chemical exposures. Again, on the beaches, in the swamps, on the boats, everywhere that workers are. And I will just let you know, we can discuss this a little more, that we have found no exposure levels to any chemicals that are of any concern. The main problem we've been seeing down there, the main concern that we've had for worker health and safety has to do with heat. As you know, people are working in very high heat conditions. Very often they are also working with Tyvek suits with chemical protective suits, gloves, which exacerbates the heat problem. Finally there was this interesting teaser about the possibility of running the production from the well to an existing platform. I believe BP is in discussion with other industry producers that have rigs in the area that might be useful for that. I don't think they concluded those yet. I just mentioned it yesterday because I was asked about whether or not there were any redundancies or any recourse if we had a hurricane or heavy weather that allowed us to move—or required us to move all of the vessels from the scene. This would be one way if you are actually connected to another drill site, you would not have to rely on service vessels. There is more on what would be involved at Upstreamonline (who asked the question). And as I drove home from work car #5 the entry from Illinois State, rolled past me and on to the finish line.